FOOD-LADEN FILMMAKER – Yukoner Suzanne Crocker’s documentary on eating only locally-produced food in Dawson City, 300 km south of the Arctic Circle, will be released in 2019. A year ago, Suzanne Crocker, an award-winning filmmaker and retired family doctor, challenged herself to spend one year feeding her family nothing but food that was local to Dawson City, where 97 per cent of food is trucked in. Her objective was to create a public conversation about food self-sufficiency. “The North is the canary in the coal mine for global food security,” Crocker said this week. Last Tuesday, she successfully marked the end of her experiment. “My feelings are a mixture of sadness, knowing that grocery store food will inevitably return to the house, and celebration at how far I’ve come in the past year,” Crocker said. It was an often-difficult experience for Crocker and her entire family. 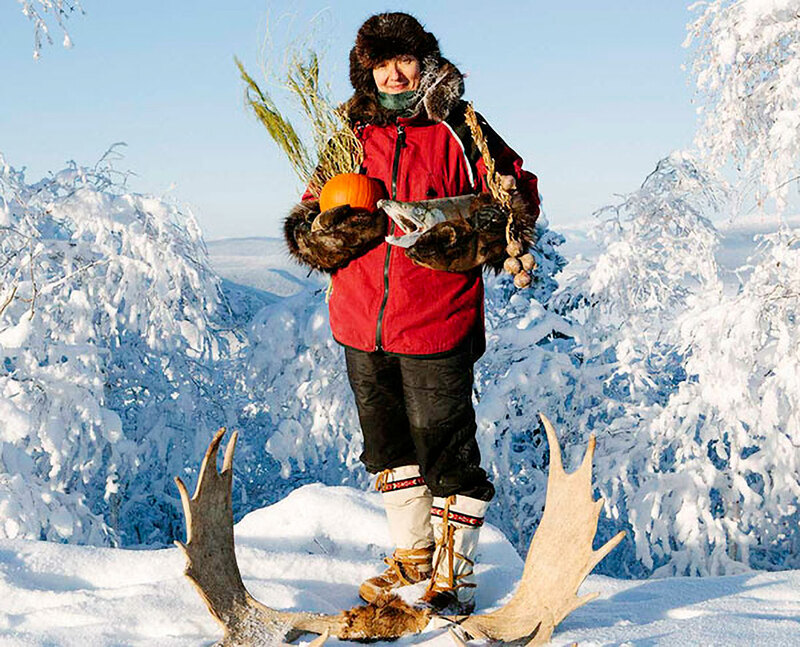 However, thanks to some creativity, ingenuity, and a lot of help from local producers, Tr’ondëk Hwëch’in citizens and the whole community, she discovered the surprising bounty of food that can be foraged, hunted, fished, grown and raised in the North. The project, Although First We Eat, has demonstrated the potential viability of northern food security. It has also exposed the vulnerabilities and inefficiencies of the current food system, with the need to look backward, to traditional practices and Indigenous wisdom, as much as plan for more efficient future methods of storage and distribution, and locally-produced fertilizer and feed. What may be practical for a small northern enclave, surrounded by wild game and unspoiled wilderness, may not seem relevant to large urban communities, Crocker pointed out. However, she believes many of the core lessons can be extrapolated to modern lifestyles. “Although some of the challenges may be specific to the North, the overall theme is global,” she said. “Dependence on food that comes from afar leads to vulnerability of communities,” she added. For Crocker, the mother, the experiment is over — although she plans to continue to support local farmers and eat as much local food as possible. But for Crocker, the filmmaker and food security activist, the journey has just begun. Foremost is to finish producing her documentary (to be released in 2019) and digital media project, to help spread the message of sustainability and Northern food security.